In order to meet ever growing customers demands, Hydrogas has engineering and producing custom-designed pumps since 1996. Modifications can often be necessitated by especially tough operating conditions and are usually determined by our engineers while processing an order. Developing new modifications every year, Hydrogas has gained a boad wealth of experience in designing unique pumping equipment. Here are the popular modifications of chemial and petrochemical pumps. 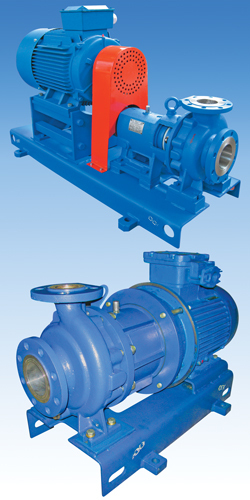 The main direction of development for all manufacturers of chemical equipment is compliance of pumps with technical and safety regulations, unification of equipment, nonstandard H-Q characteristics, explosion protection, and seismic stability. belts by the best manufacturers guarantee reliabiliy throughout the pumps life cycle. All the pumps in Hydrogas product line, except unit construction pumps, can be made with V-belt drives. Oil-processing companies often have to deal with high-temperature oil products (+250...400C). As a rule, the companies use expensive oil pumps with double face seals and a complex cooling system. However, a more reasonable alternative would be to use hermetic pumps with magnetic couplings with an original design of thermobarriers including ceramic parts, extra ribbing, forced convection, etc. SmCo magnets guarantee reliable work of magnetic couplings throughout the life cycle..
High inlet pressure pumps . Hydrogas manufactures hermetic pumps which can be operated at high inlet pressure (up to 63 atm. ), ambient temperature from -60 to +50C and medium temperature up to +250C. The pumps have an in-built cyclone separator, which prevents the solids from getting in the bushings. The pumps can be installed in oil-trunk pipelines and other technological positions. Hydrogas was the first company in Russia to design and manufacture lined pumps and valves. Today Hydrogas is a leader in producing chemical equipment capable of handling aggressive media and resistant to abrasive wear. The hypermodular polyethylene PE-UHMW, which Hydrogas uses, is different from standard polyethylene in the sense that its molecule contains thousands of links and its molecular weight is several million. The company uses different types of PE-UHMW with different molecular weights and molecular structures depending on the application and processing methods. This polymer material can substitute steel, bronze, and expensive polymers like fluoroplastic. Ultra-high molecular weight accounts for the unique properties of the polymer: high wear and impact resistance, higher hardness, low coefficient of sliding friction. PE-UHMW is resistant to acids, alkalis, salines, aggressive gases, sea water, radiation, temperature cycling, and has a low water absorption. The characteristics remain stable wihin the temperature range from -90 to +80C. PE-UHMW composites are characterised by even better properties. They are widely used in mine industry, motor industry, mechanical engineering and military-industrial complex.